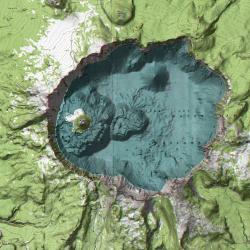 On the Cover: An anaglyph stereo map of Crater Lake constructed from the USGS East and West Crater Lake DRGs and DEMs. The lake bathymetry produced by James V. Gardner, Larry A. Mayer, and Mark Butenica was merged into the USGS topographic data. Anaglyph maps like this one allow most students to more easily grasp the land surface geometry that topographic maps try to convey. Red/Blue 3D glasses allow viewing of this image in 3 dimensions. Novice earth science students often have difficulty visualizing three-dimensional interpretations of flat, two-dimensional displays. This challenge becomes apparent when students attempt to comprehend topographic maps. In this study, we investigated conditions that influence such activity. Earth science students viewed standard topographic maps, maps that included shading, maps that included stereo visualization (affording a three-dimensional percept of the map), or maps with both stereo visualization and shading. Students answered line-of-sight questions (i.e., intervisibility tasks) while viewing their assigned map. These questions required students to visualize a route-perspective from the map's survey-perspective, with particular attention to the terrain relief. Tasks like this are routinely completed during topographic map experiences, and provide insight into a user's understanding of the dynamic land surfaces conveyed by those maps. Overall, stereo visualization was more successful than shading in facilitating students' completion of the task. Students' general performance was not influenced by gender, but was influenced by other background characteristics (e.g., expected course grades, prior map experience, and predilections for outdoors activity). Students also preferred maps employing three-dimensional cues more than maps without them. Classroom activities in the earth sciences may benefit from incorporating stereo visualizations into map-learning exercises. A series of exercises has been gathered into an inquiry-based writing assignment for an undergraduate course in sedimentary geology, the purpose of which is to improve students' skills in geological reasoning, problem solving, and writing. The seven exercises contain petrographic data relating to the mineral composition of detrital sediments, and these data are to be plotted in various formats including QFL triangular diagrams, X-Y graphs, and histograms. Students then write an interpretive report explaining the results and meaning of each individual plot and integrating the results into a general discussion of the major controls on composition. Although the objective of each data set tends to be readily apprehended, students must rely on their own powers of geological reasoning to interpret these seven exercises. Their synthesis addresses the most important factors that control or influence detrital mineral composition: parent rock, tectonic setting, topography in source area, climate, transport distance, durability of grains, depositional environment, and diagenesis. In the final analysis, students come to realize the complexity involved in the making of a detrital sediment. Sequence stratigraphy has become a central topic for sedimentology and stratigraphy. While outcrop studies are an important part of introducing sequence stratigraphic concepts to students, computer models go beyond the mostly descriptive approach in that they can be used to evaluate the importance of different factors leading to stratigraphic change (e.g., changes in sea level, sedimentation rates, etc). Students can use a combination of a stratigraphic simulation package (STRATA) and an evolutionary random branching model (BIOSTRAT) to simulate stratigraphic sequences and their bounding unconformities across a basin and the stratigraphic distribution of species within these sequences. Students can explore processes responsible for forming stratigraphic sequences, assess the relative importance of global sea-level fluctuations in unconformity generation, and investigate the underlying causes for the stratigraphic distribution of different species. Furthermore, students can use the simulated data set to perform graphic correlation in order to study how stratigraphic correlation is impacted by correlations across facies changes and important sequence stratigraphic surfaces (i.e., flooding surfaces, unconformities, etc). Directed inquiry is used in an introductory geology class at Northern Kentucky University as a means for introducing students to the role of geology in community politics while also teaching students critical thinking skills, data analysis skills and group interaction skills. Students are instructed that they will be evaluating the geologic setting of a city of their choice in order to provide a recommendation to a company that is considering relocating to their city. Through the project, students must evaluate the geologic hazards and benefits of the city and present a summary and recommendation based on their findings. The project is divided into three subprojects throughout the semester - plate tectonics, geologic history and topographic setting. For each subproject, students are provided a data set that they must interpret and summarize in a written report. The results of these subprojects are used to characterize the geologic hazards and benefits of the city that the students present in a final PowerPoint presentation. Student knowledge is assessed through questions on the final exam that address similar scenarios in other cities, in order to determine whether they can apply the concepts learned in the project to new situations. As presented, this project is suitable for relatively small classes (approximately 40 students). In larger lecture classes, the project can be modified as a report or a series of assignments. General education requirements for science classes exist to convey science literacy. The realm of science concerns matter, energy, and time. A particular value of geology lies in providing students with understanding of change through time, which enables one to conceptualize the temporal qualities of change in general. Students arrive in college with limited awareness of time based on common-sense models derived from personal experience, but deeper understanding of science is possible by learning how to consider age, order of events, patterns, rates, magnitudes, durations and frequencies. Tracing origins of our modern ideas about temporal qualities helps us to understand how the process of discovery produced the framework of reasoning unique to geoscience. Lifelong applications result if one realizes how awareness of the temporal qualities of a process influence everyone's perceptions of events caused specifically by that process. For example, the process that produces strong, infrequent earthquake events in the Midwest can lead those living there during long time spans between events to perceive there is no danger. Inappropriate building codes, insurance availability, etc., there result largely from such misperceptions. This paper presents some effective active learning classroom activities: role play, timeline exercises, scaling, storytelling, and group analyses of natural phenomena as a means to promote conceptual thinking about change through time. All exercises, instructional aids, and tools mentioned are available in a downloadable zip file. The transport of pollutants in groundwater systems is an important concept taught in contaminant hydrology. Yet, surprisingly, no relevant soil column experiments have been described in the pedagogical literature (Journal of Chemical Education, Chemical Education Research and Practice, or Journal of Geoscience Education). This experiment illustrates the transport of tracers in a sand column using the conservative (non-retained and non-reactive) tracer fluorescein, along with a step input of non-conservative (retained/adsorbed) cadmium ion. The experiment is easy to set up, uses inexpensive commercially-available glassware and sand, and is highly reproducible. Step inputs of conservative tracer elute in one pore volume (the volume needed to completely replace the water held in the saturated column), with cadmium eluting in three pore volumes. This experiment can be completed in two, three-hour laboratory periods. The Mohs scale is enshrined in geoscience curricula as a simple and effective tool for identifying minerals and understanding the influence of crystal structure and chemistry on physical properties; e.g., hardness. Measuring scratch resistance is different from measuring hardness, however, because scratching involves components of loading and shearing, whereas "absolute" hardness is measured by the response of a material to vertical loading (indentation). Although it is not practical for most undergraduate classes to do indentation hardness testing, students can evaluate tabulated quantitative hardness data and compare these data with their own determination of relative scratch resistance. To help students better understand physical properties of minerals, and in particular the concept of mineral hardness, we present an example exercise based on recent systematic measurements of the hardness of Mohs scale minerals using indentation techniques. This exercise allows students to explore the differences in hardness among minerals of the Mohs scale, enhancing their understanding of the Mohs scale itself as well as the chemical and physical factors that influence mineral hardness. The exercise is most appropriate for Earth materials and mineralogy classes, but can be adapted for students with different levels of expertise, including introductory physical science students. This study examines whether middle school students learn as much via Problem-based Learning (PBL) as they do in non-PBL classrooms on multiple-choice tests. The questions on the tests covered textbook content, were predominantly fact-based, and provided by the textbook publisher on a CD-ROM supplied with the text. While not all aspects of "high-stakes" testing involve the use of multiple-choice questions, high-stakes testing often contains a large number of these types of questions. In addition, both the process and final product(s) produced via PBL are often assessed; whereas high-stakes tests seldom have students develop products outside of the completion of a pencil and paper test. Two eighth-grade gifted and talented science classes in a Midwest public middle school were compared. Focused observations, interviews, test score analyses, and document analyses were used. Problem-based learning is an educational approach where a purposefully ill-structured problem initiates learning and the teacher serves as a coach instead of an information repository (Gallagher and Stepien, 1996). Problem-based learning has many similarities to project-based learning. PBL is necessarily interdisciplinary. PBL is also based upon the theories of situated cognition (Brown, Collins, and Duguid, 1989; Plucker and Nowak, 2000; Resnick, 1987), and consistent with the principles of constructivism (Savery and Duffy, 1995). Questions have been raised about the appropriateness of using PBL in the middle school setting. Multiple-choice test score analyses of geology and astronomy content indicate that students in a teacher-directed classroom learn more fact-based content than via PBL. Students engaged in PBL have better retention. In a high-stakes testing society with many inherent issues (Casbarro, 2005; Grant, 2004; Marchant, 2003), the best solution is likely an integrated PBL project approach. Teacher-directed instruction could be intentionally embedded within a PBL project instructional model. This study documents a support system that arose in the context of an NSF-funded, three-year professional development initiative for middle and high school earth/environmental science teachers entitled Earth-View (ESI-9911850). Three data sources are reported in this paper that reveal the importance of the community in supporting learning for the Earth-View teachers including: (a) rankings of program components resulting from Likert scale items; (b) responses to open-ended items; and (c) interview data. The researchers identified several aspects of the Earth-View community of learners that might profitably be incorporated into other professional development programs aimed at enhancing middle and high school level earth/environmental science teacher quality, including: (a) interactions with faculty beyond the formal instructional settings; (b) extensive year-round communications with other participants, especially the small groups with which they identified during the summer sessions; and (c) a strong content focus aimed at the instructional responsibilities that the teachers have in common. Poor performance by elementary school students on science assessment tests is due in part to inadequate science education for teachers. Environmental Science for Elementary School Teachers (ESEST) is a 14-year collaboration between university faculty in geology and biology and public school teachers in Ohio. The primary goal of this immersion, field-based program is to increase K-6 teacher knowledge of basic principles of environmental science. Participants and in structors take daily trips to field locations; hands-on activities are used to illustrate concepts such as geologic time and use of biotic indices to assess stream quality. Qualitative and quantitative assessments indicate a two-fold increase in content knowledge and an improvement in teaching skills by our participants. Further, participants return to their classrooms with the confidence to teach state academic content standards and an increased sense of independence. We argue that partnerships between K-12 and post-secondary institutions are critical to effective teacher education: most school systems do not have the infrastructure or funding to deliver a program of this nature on their own. ESEST meets multiple criteria for professional development for teachers. Our experience indicates that the program is successful because participants are immersed in a physically and mentally challenging, collaborative, outdoor learning environment. We designed new laboratory exercises for undergraduate igneous petrology that teach the fundamentals of petrography and petrology within the framework of tectonic environments. Our exercises are designed to promote the use of the scientific method by requiring students to collect and use data to test hypotheses and petrogenetic concepts presented in lecture. The integration of fundamental concepts of petrology with geologic and tectonic settings, in our case drawing on the diversity found in California, allows for the introduction of more advanced material in both the laboratory and lecture portions of the course. Student written feedback and performance on exams, laboratory exercises, and final projects reflect an increased understanding of the subject matter and confidence in problem solving. This type of class structure is transportable to programs in any location, can be used for classes of reasonable size, and is an effective method to teach science classes at either an introductory or advanced level. This study assessed how combining active learning measures with teaching slides that relied on sentence headlines affected test scores and attendance in a large resources geology course. For all six sections of the course, the following remained the same: instructor, classroom, semester time slot, and number of teaching slides. For two sections, though, we transformed the existing teaching slides that followed the traditional design of a phrase headline supported by a bulleted list (and often an image) to a sentence-headline design supported by visual evidence. In this new design, the sentence headline stated the main assertion of the slide. To increase active participation, we posted these sentence-headline slides as fill-in-the-blank notes, as opposed to complete slides as posted for the other sections. To increase attendance in these two sections, we administered a graded activity in each class period. These two sections had statistically significant increases (p < 0.001) in both class attendance and test scores on identical questions.